Soulja Boy’s SouljaGame console and handheld were Chinese knockoff devices running emulated games from the Sega Genesis, Neo Geo, Capcom’s arcade systems, and Nintendo’s home consoles. Many gamers began alerting Nintendo about the use of their ROMs in Soulja Boy’s game devices, and originally the rapper-turned-pseudo-entrepreneur blew off the comments, but recently his tune has changed. MyNintendoNews is reporting that Soulja Boy has recently recanted his haughty attitude toward selling the gaming devices from his website, and issued a more humbling tweet. Soulja Boy doesn’t say why he had to remove the consoles from his website, but most people assume it’s because he was sent a cease and desist notice from Nintendo, who was repeatedly alerted to the rapper’s attempts to sell consoles containing illegally distributed ROMs through his website. Hilariously enough, if you attempt to visit the Souljagame.com website, it redirects you to the Nintendo page for the 3DS, which is presumably why most people think that Nintendo put pressure on Soulja Boy to stop selling the devices, as reported by Lawful Masses With Leonard French. 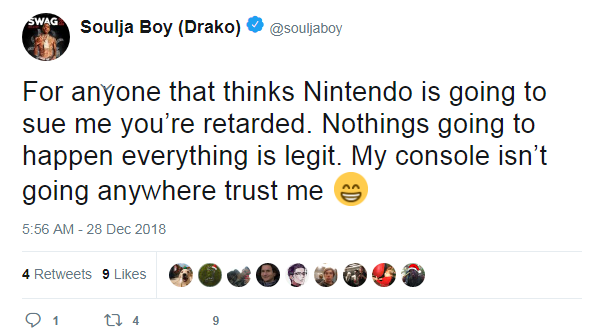 This is an about-face from Soulja Boy’s previous stance, where he claimed just a day before on December 28th, 2019 that people were “retarded” for thinking Nintendo would sue him. He was rather haughty before the December 29th, 2018 tweet because the console was supposedly selling by the thousands, and he was making a lot of cash on moving the hardware that came bundled in with the software. Most people pointed out that the console seemed like a mish-mash of rip-offs from existing consoles, but it didn’t faze the rapper. There were even various corrupt outlets that seemed to show support for the illegal behavior.